Wow, thanks for posting this! Brings back memories. The Oblivion songs are Magic Theatre and Judgement Day (which is cut off in the video). The guy introducing Oblivion is the infamous Lou Perfidio. 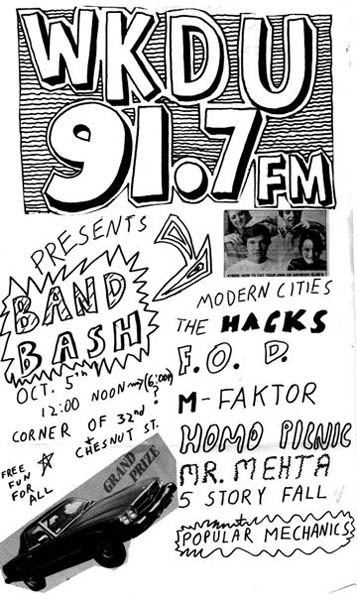 We really wanted to play this show but the folks at WKDU wouldn’t allow it. It was the first show with new lineup around the time we were starting to get good. We literally had to force our way on stage and with the help of friends in Homo Picnic got to play a short set. WKDU pulled the plug after a few songs!